Damian “Jr. Gong” Marley has announced the return of the 4th Annual Welcome to Jamrock Reggae Cruise, set for November 13-18, 2017. Cruisers will aboard Royal Caribbean’s “Independence of The Seas” on November 13, 2017, making stops in Montego Bay and Ocho Rios Jamaica before returning on November 18, 2017. Tickets are now on sale and can be purchased by visiting WelcomeToJamrockReggaeCruise.com. The 4th annual cruise announces full lineup of artists including Damian “Jr. Gong” Marley, Stephen “Ragga” Marley, Sizzla, Jah Cure, Luciano, The Big Ship Crew (ft. Freddie McGregor, Stephen "Di Genius" Mcgregor and Chino McGregor), Bounty Killer, Tarrus Riley, Cocoa Tea, Busy Signal, Popcaan, Inner Circle, Richie Spice, Tanto Metro & Devonte, Pressure, Spice, Iba Mahr. Also joining are Sound Systems including Stone Love, Renaissance, King Jammy’s, Mighty Crown, Tony Matterhorn, and Kingston 12 Hi Fi. More artists, DJs and Sound Systems to be announced! 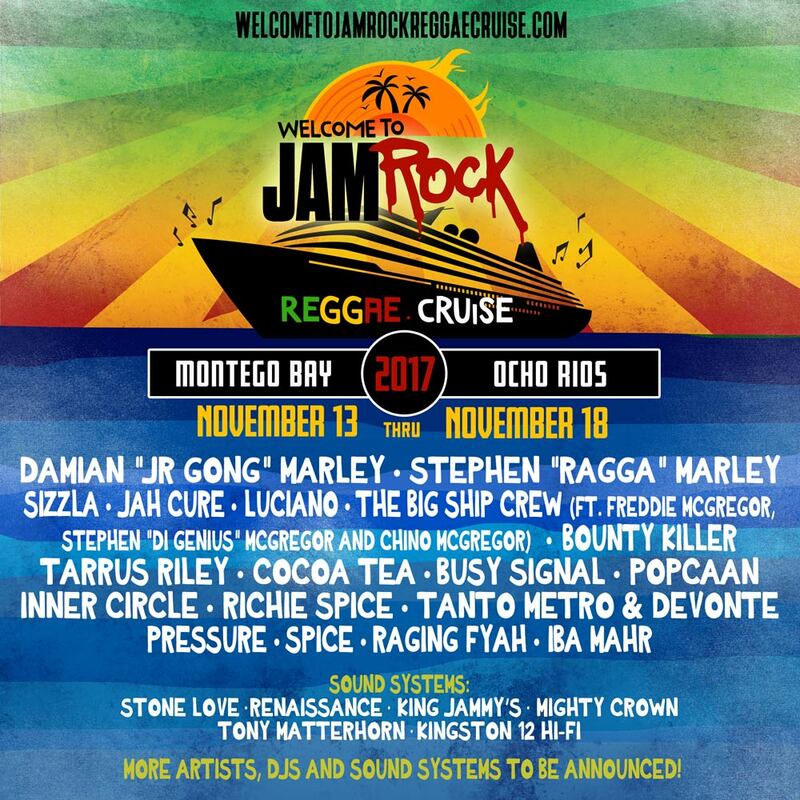 Jamrock has infused the cruise industry with a one-of-a-kind Reggae experience, and has become one of the most exciting and talked about Reggae gatherings in the world. For music lovers, it is notably the only place to see some of the top reggae artists who are not able to travel and perform in the US . The 2016 cruise currently has fans from over 40 nations all over the globe converging for their love of Reggae music and culture.